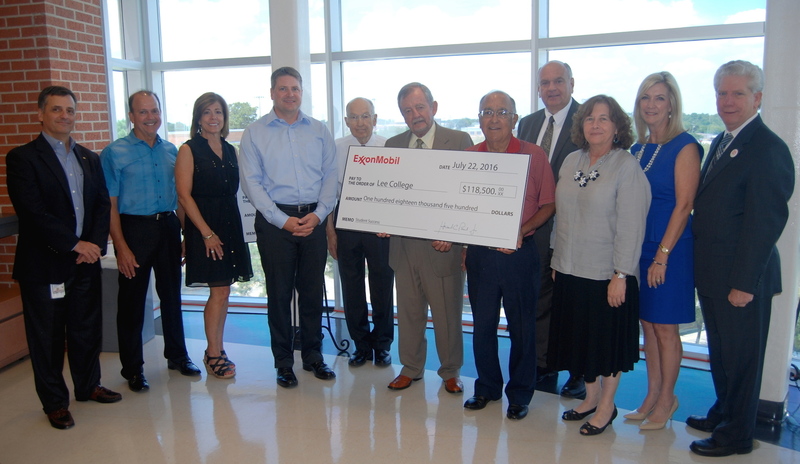 Lee College students selected to receive scholarships this year from the Community College Petrochemical Initiative attended a recognition luncheon Thursday, Aug. 3, 2017, at the ExxonMobil office in Baytown. 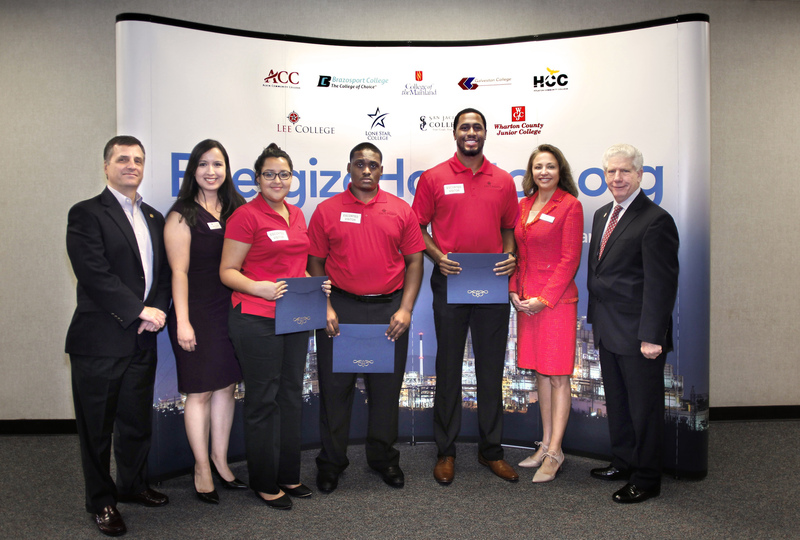 Pictured (l-r): Woody Paul, Manager of the ExxonMobil Baytown Olefins Plant; Dr. Christina Ponce, Lee College Executive Vice President; students Crisol Napoles, Edmeade Prentice and Christopher Patterson; Dr. Angela Oriano, Lee College Vice President of Workforce & Corporate Partnerships; and Dr. Dennis Brown, Lee College President. BAYTOWN, TX — After leaving school 10 years ago to focus on his family, Christopher Patterson willingly accepted a pay cut to be able to return to Lee College and finish what he started: pursuit of an associate degree. 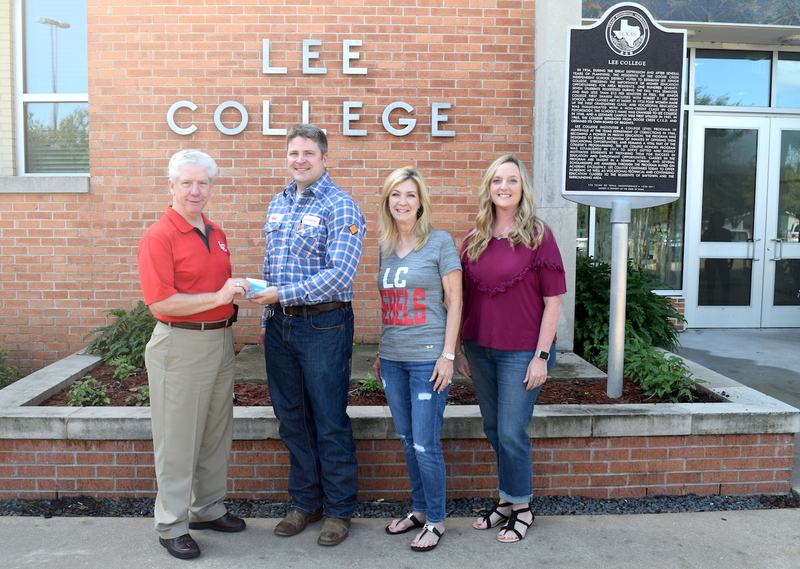 Now majoring in process technology, Patterson is one of three Lee College students who will receive scholarships this year from the Community College Petrochemical Initiative (CCPI). 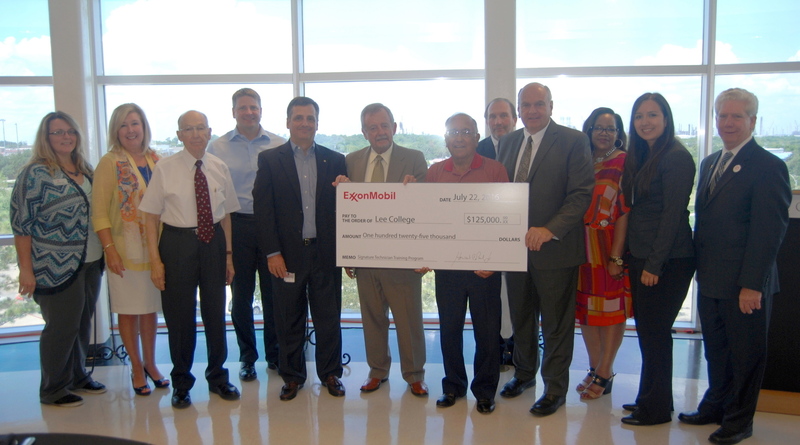 Crisol Napoles and Edmeade Prentice were also selected and joined other scholarship recipients Aug. 3 at the ExxonMobil office in Baytown for a recognition luncheon. In total, CCPI awarded $45,000 in scholarships to 38 students from all nine community colleges along the Texas Gulf Coast that can be used for tuition, fees, books or other training program expenses. Funded through a grant from ExxonMobil, CCPI is a collaboration of the Texas Gulf Coast community colleges to recruit and train the next generation of petrochemical and construction trades workers for the Houston-Galveston region. Since its launch five years ago, ExxonMobil has contributed more than $2 million to CCPI to support training in petrochemical fields like computer-aided drafting and design, electrical technology, instrumentation, machine technology, millwrighting, pipefitting, process technology and welding. Lee College is the lead institution in the initiative. Potential salaries average nearly $100,000 a year for skilled workers in the growing chemical manufacturing industry, and companies are projected to need more than 50,000 new workers in the Gulf Coast area over the next 10 years. In a keynote address to the scholarship recipients, Mike Zamora, director of Americas Regional Manufacturing for ExxonMobil Chemical, praised the work of the CCPI and noted the wealth of opportunities awaiting students as they prepare to embark on petrochemical careers. Debi Jordan, second from the left, with Lee College President Dr. Dennis Brown, Lee College’s Community College Petrochemical Initiative (CCPI) 2016 scholarship recipients, Executive Vice President Dr. Christina Ponce and CCPI Grant Coordinator Kelly Dando at the 2016 CCPI Scholarship Reception. Jordan will retire from her position as Vice President of Workforce and Corporate Partnerships in January 2017. BAYTOWN, TX — When Debi Jordan was given the task of researching self-sustaining training programs at community colleges in 2005, she had no idea where it would end up. Seven years later, Lee College President Dr. Dennis Brown and its Board of Regents gave the go-ahead to launch the Lee College Center for Workforce and Community Development, and after a nationwide search, Jordan was selected to lead. Now Jordan, the Vice President of Workforce and Corporate Partnerships, is ready to experience another new chapter: retirement. Jordan’s daughter is expecting a little girl in December, and she said though the decision was difficult, it became much easier with each ultrasound she saw. Over the past four years, the center has hosted 1,710 classes, served 7,694 different students and boasts a total enrollment count of 17,559 thanks to repeat students. Jordan helped establish and maintain partnerships with organizations like the Baytown/West Chambers County Economic Development Foundation, Houston Livestock Show and Rodeo, East Harris County Manufacturers Association, Economic Alliance Houston Port Region and the Greater Houston Partnership, as well as industry partners such as ExxonMobil, ChevronPhillips Chemical, Enterprise Products, Covestro, Shell, Bechtel and Jacobs. Pam Warford, Executive Director of the Lee College Foundation, Director of Foundation and Donor Relations and a lifelong friend, described Jordan’s contributions to the college as intangible. Jordan helped organize and lead ExxonMobil’s initial $500,000 grant that established the CCPI. 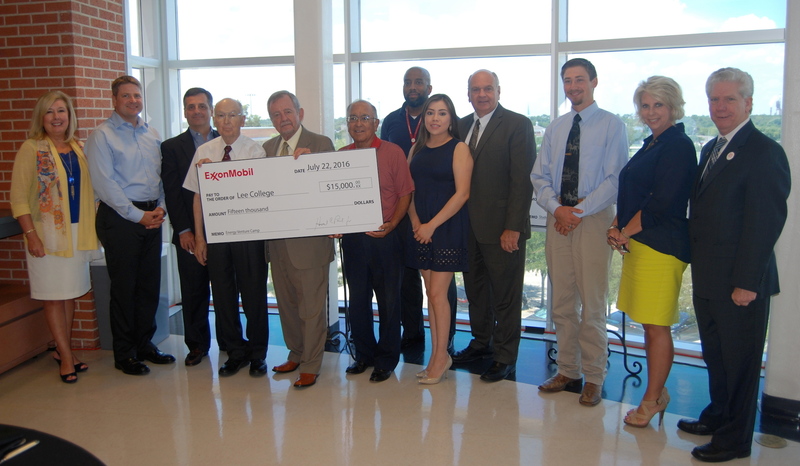 The grant, which has since increased to a total of total of $1.8 million, funds workforce development for the Houston-area petrochemical industry through nine local community colleges. In the interim, leadership of regional workforce initiatives will transition to Ponce. The Center’s leadership, which includes Interim Director of Corporate Services Marsha Tuha, Community Education Director Kimberlee Techeira and Business Operations Manager Delma Garcia, will lead the teams and day-to-day operations of the center under Ponce’s direction. Jordan’s retirement is effective Jan. 1, 2017. She has also been a partner in an independent insurance agency in West Texas for nearly 30 years. She is a licensed agent, and plans on becoming more involved in the business. Lee College thanks Jordan for her dedication & long-lasting impact in the community and workforce training.